Candace Lately: Tailpipes' "Burger Box"
Have you heard of Tailpipes new promotion? 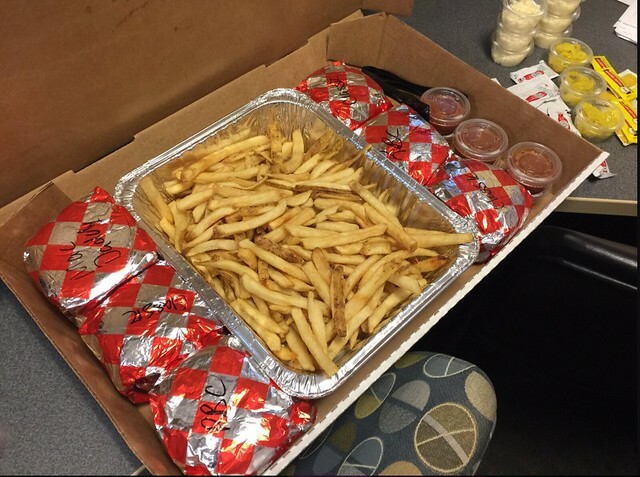 They have this new "Burger Box" that is perfect for office lunches or meetings or parties because you can get six burgers, fries, and fry sauce for $55. That's a pretty good deal considering most of Tailpipes' specialty burgers are $10. And, no, I'm not being paid to say this. I just think it's cool, and my team recently had the chance to enjoy one. We all got different burgers; I opted for the Corvette - fried green tomato, pimento cheese, smoked bacon, cole slaw, Carolina bbq sauce on a white bun. Others got the barracuda, the mustang, the cajun burger, a bacon cheeseburger and another plain cheeseburger. So, it's nice to accommodate a wide assortment of palates. The photo above was actually form Honors Hall because I was somehow too hungry (or too clumsy) to take a photo of the burgers before my team devoured them. But, it seems as though Tailpipes is trying to make it a known thing and doing contests for offices to enjoy these, so you might get lucky if you keep an eye on their social media!